Folds up for easy storage after use. Strong and durable 100% non woven polypropylene construction can be used over and over again. 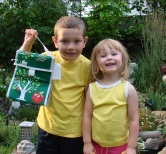 Hook and loop Velcro seal is children friendly and easy to open and close. Cleans up quickly with simply a wipe! What is a Green Bag made of? 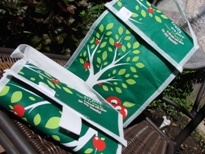 Our bags are made from 100% nonwoven polypropylene. 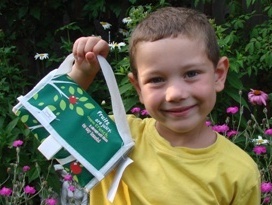 NWPP is recyclable, non-toxic, allergy-free and colour-fast. It is often used for food containers, toothbrushes and surgical fabrics. Recent improvements to the manufacturing process have resulted in a reduction of the lead and cadmium levels in our bags to 1/10 of their original levels, in effect creating an "unleaded" bag.